perfect for teachers for a creative school-time craft to decorate the classroom for Easter and perfect for parents to give kids something to do during April showers. Grab a few potatoes, (it doesn’t matter which kind- all work great) and slice them in half. For larger eggs cut vertically and for smaller ones cut horizontally. Using child-friendly carving tools or a knife carve designs into the egg, similar to those on an Easter egg. (Example: polka dots, stripes, zig zags, etc.) If you are using child-friendly carving tools invite the kids to help out. What designs would they like to carve? Be sure to rinse and dry the potato after carving to remove any excess. Allow the children to apply paint to the potato either by brushing it on or dipping it into the paint. Like a stamp, press the potato onto construction paper. Mix up the colors and designs, and of course- have fun! Enjoy & Happy Crafting! The biggest thing to remember when it comes to crafting, especially with little ones, is that imperfection and messy is best. 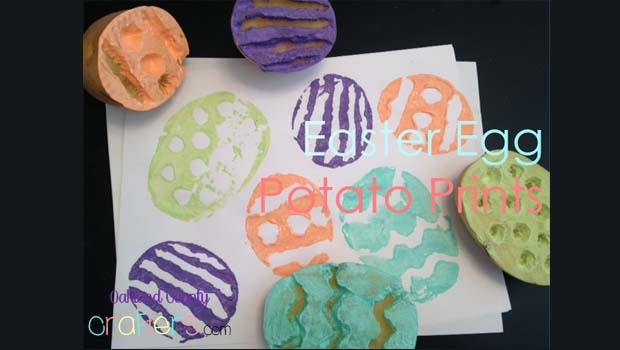 This Easter Egg Potato Prints craft for kids article submitted to Oakland County Moms by Samantha Bronsing of Oakland County Crafters. See related articles below for more crafts for kids and Easter fun! Do you have an Easter craft for kids to share?